If you own a car, you should know how to perform basic inspections, including checking and topping off fluid levels. It only takes a few minutes, and making it a habit could prevent a roadside emergency. Here’s how to check the five most important fluid levels in your car. Park your car on level ground and let it sit for five minutes so the oil can settle. Look for a colorful handle under the hood labeled “oil.” This is the dipstick. Remove the dipstick and wipe it dry with a paper towel. Dip it back inside the tube and remove it again. Check the level on the stick. It should be between the minimum and maximum indicator marks. If the level is low, pour a half-quart or so of oil into the tube. Also examine the color of the oil. It should look like honey. If the oil appears dark, bring your car to Scott’s Fort Collins Auto & Repair for an oil change. Locate the coolant reservoir under the hood. The owner’s manual will give you the exact location. 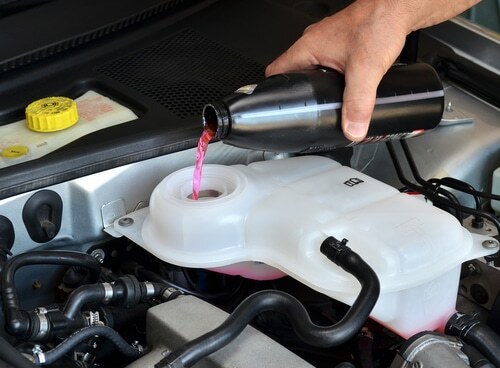 Check whether the liquid inside reaches the “full” indicator line on the side of the coolant reservoir. If not, add an appropriate 50/50 mix of coolant and water to the reservoir. Let the engine cool for 10 minutes before attempting to add coolant. Locate the brake fluid reservoir, which is normally on top of the engine. Clean the area around the cap with an approved aerosol spray. If any dirt or dust falls into the brake fluid, you could end up with a costly repair. Gently open the cap and check the fluid level as indicated by the dipstick attached to the underside of the cap. If the fluid level is low, bring your car to Scott’s for brake service. Never attempt to refill the reservoir with old brake fluid, since this could harm the system. For an automatic transmission, you must leave the car running to check the transmission fluid. Remove the appropriate dipstick, wipe it clean and dip it back into the fluid. Check the level against the markings on the dipstick. For a manual transmission, it’s less likely you’ll find a dipstick for the transmission fluid. It’s best to have a Scott’s mechanic check this fluid level while performing an oil change. If the transmission fluid is low, seek professional service immediately. Look for the windshield cleaning fluid reservoir, located in a clear tank with a blue lid. Pour blue windshield cleaner into the reservoir until it reaches the “full” line on the neck of the reservoir. Stop by Scott’s Fort Collins Auto & Repair if you need help checking any of these fluid levels or if you discover your car requires professional service. You can also schedule an appointment online or call ahead at (970) 682-4202.